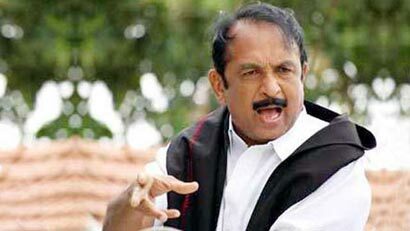 Opposing the gifting away of an Indian Coast Guard ship to Sri Lanka, Indian MDMK chief Vaiko today said it was a “betrayal” of Eelam Tamils and Tamil Nadu fishermen the Press Trust of India reported. Indian Coast Guard Ship ‘Varaha’ was gifted to Sri Lanka on August 27 in Colombo. The ship was in the service of the island nation since 2006 and it was rechristened ‘Sagara’ by Sri Lanka. It was formally handed over at a ceremonial function in the presence of Indian and Sri Lankan top officials, according to the island nation’s official website. Accusing the UPA-I and its constituent parties from Tamil Nadu the DMK and PMK of being responsible for the large scale killings of Tamils during the 2009 war, he accused the Indian goverment of continuing to work against the interests of Tamils.